Read our helpful guide to second hand Ferrari 599. AA Cars works closely with thousands of UK used car dealers to bring you one of the largest selections of Ferrari 599 cars on the market. You can also browse Ferrari dealers to find a second hand car close to you today. 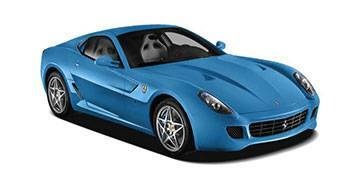 All used Ferrari 599 on the AA Cars website come with free 12 months breakdown cover. The 599 GTO was at the time of release, called by Ferrari themselves their ?most extreme sportscar", which gives an indication as to what sort of ferocious and vicious power lurks beneath its immaculately styled hood. As a successor to the 575M crown, it features a 6.0 litre V12 engine, 671bhp and manages a remarkable 0-60mph sprint time of just 3.3 seconds. Impressive grip keeps the car in check, but along with its top speed of just over 200mph, the 599 is at its best when on the track. That's not to say it isn't a joy to drive on the road - it certainly draws plenty of admiration and jealousy from other drivers - but it is a car which is almost too powerful to handle. Which, of course, is never a bad thing.